By Mike Carey and Peter Gross, et al. The Unwritten is the story of Tom Taylor, son of a dead writer - Wilson Taylor - who enjoyed enormous success with a blatantly Harry-Potter-esque series of novels. The series begins with Taylor living off his father's fandom. When questions of Taylor's identity and his real connection to his more famous father arise; Tom finds himself in an unrecognizable world of magic, supernatural killers, and dark conspiracies reaching back centuries. The first volume ends with a super-strong murderer slaughtering a group of writers in Wilson Taylor's old villa. Tom is wrongly accused of the killings and as the French police carry him off he spots a mystical ally who is only supposed to exist in his father's novels. 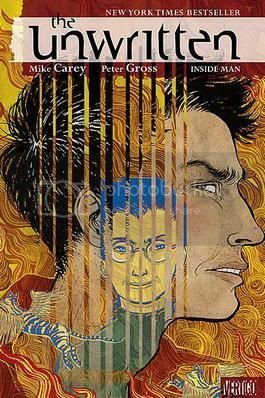 The second volume - The Unwritten: Inside Man - begins with Tom Taylor carted off to prison. He quickly befriends the seemingly more streetwise Savoy, who hides a Tom-Taylor-specific agenda for his imprisonment. In the meantime Tom's enigmatic ally Lizzie Hexam gets herself sent to prison so she can help Tom, a squad of assassins heads to the jail to kill Taylor and steamroll anyone in their way, a prison riot climaxes with yet another character from Wilson Taylor's imagination emerging in the real world to find Tom (but this one isn't there to help him) and there are strong hints that Wilson Taylor isn't as dead as everyone believes. Just as the first volume ended with a stand-alone story - a fictionalized retelling of the life of Rudyard Kipling - Inside Man ends with the dark and hilarious tale of a man trapped in a children's book story as the foul-mouthed and murderous rabbit Mister Bun. The Unwritten hits its stride with this second volume. The first volume was wonderful, but I felt much more swept up in a page-turning urge as I read Inside Man. Unburdened with the set-up, the story is more enthralling. As soon as the volume begins Tom is almost completely past that often frustrating denial stage characters in stories featuring the supernatural always experience, and his eventual acceptance helps the story move at a faster pace. Carey reveals more about the conspiracy aimed at Tom Taylor and the bizarre fiction/real world relationship that drives it. Lizzie communicates with Wilson (presumably either he's in hiding or she speaks with his ghost) by speaking into books she pulls off the shelves of a bookstore and opens them to find his typed response. After escaping the prison; Tom, Lizzie, and Savoy travel to a ghost-like landscape set in World War II Germany where Tom must use the powers he doesn't yet understand to "fix" a story corrupted by the German propaganda machine. Not unlike a Lost-modeled TV show, The Unwritten keeps you guessing about what exactly is going on. Is Tom really Wilson Taylor's fictional hero Tommy Taylor and is the "real world" just a ruse concocted to protect him? Is Tom Taylor even real? What does this mysterious cabal want with Tom and what the hell does it have to do with fiction and its writers? What I find unique about the mysteries Carey presents us with is that I feel none of the usual frustration when theorizing about what's "really" going on in The Unwritten. Carey has so much fun playing with the notions of stories and fiction - and turning these notions into plot elements of a supernatural thriller - that I'm content to enjoy the ride and trust I'll get my answers in due time. On a bit of what I hope won't be a stupidly cryptic tangent; a very specific character is pulled from the fictional world into the real one in the beginning of Inside Man, and I was pleasantly surprised with his return to the narrative. When I reviewed the first volume in February and mentioned how much I enjoyed Peter Gross's rendering of the character, I never expected him to return, and now I'm looking forward to what will hopefully be some more sightings. I have changed my mind about one thing between the first volume and this one. I still don't like the faux Internet pages, but I think I see their purpose more clearly. The Unwritten is a story about stories and since it's set in in the present, it makes sense to involve the format in which most of our stories are being told. Still, they turn me off and I usually just skip them. My personal knee-jerk reactions aside, The Unwritten: Inside Man is a great second act and hopefully there will be a lot more. I haven't read this book, but every month it has the most gorgeous covers, and I'm tempted. I'd definitely recommend it. If nothing else, get the first volume out of the library. It's good stuff.